No introduction should be required here. 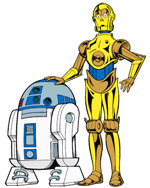 Stars of DROIDS and appearing in all movies of the Original and Prequel Trilogies. Full stats can be found in Galaxy Guide 3: The Empire Strikes Back; p77 & p78. Speeder racer from Ingo. 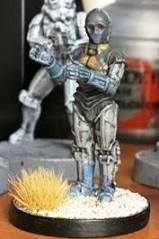 He, along with Jord Dusat, constructed and raced The White Witch speeder in the Boonta Speeder Race. During the time he owned R2-D2 & C-3PO he was accidentally involved with Tig Fromm and the criminal Fromm gang, even having a run-in with the infamous Bounty Hunter, Boba Fett. Speeder racer from Ingo and partner of Thall Joben. Co-built The White Witch speeder. Where Thall Joben went, so did Jord Dusat. After accidentally discovering Tig Fromm's secret base he was taken prisoner until Thall, Kea Moll, C-3PO and R2-D2 rescued him. 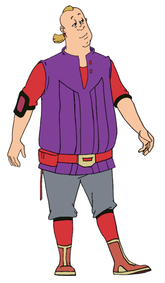 Member of Rebel resistance from Annoo. She was sent on a mission by her mother to destroy the Trigon One, a powerful weapon being built by the criminal Fromm gang. One her mission she encountered Thall Joben, and helped rescue Jord Dusat from Tig Fromm. She helped the racers get to the Boonta Speeder race and defeat the Fromm gang. An Imperial officer who commanded the Gladiator-Class Star Destroyer, Demolisher. One of the first Admirals in the Emperors New Order. He served with Grand Moff Tarkin, and previously served alongside Jan Dodonna in the Old Republic Judicial Department. He spent many years in his Imperial service seeking out new opportunities in the Outer Rim including searching for the fabled Roon Stones and dealing with the Great Heap. Some call him the galaxy's greatest Bounty Hunter. He is ruthless and methodical, but don't expect him to follow any Bounty Hunter Code, he follows only his own rules. He makes an appearance in DROIDS when he is hired by the Fromm gang to capture Thall Joben and Jord Dusat. But when chasing down The White Witch R2-D2 washes off a Thermal Detonator placed on the racing speeder, only for the explosive device to fly backwards and blow up Boba Fett's speeder; Fett escaping at the last moment. Having enough with this chase Boba Fett decides it's easier money to take in the Fromm gang and hand them over to Jabba the Hutt. Full stats can be found in Galaxy Guide 3: The Empire Strikes Back; p55. BL-17 is a BL-series Battle Legionnaire, created to serve the Confederacy of Independent Systems during the Clone Wars. 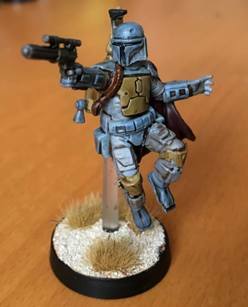 He is owned by the Bounty Hunter, Boba Fett. During the time Fett was working for the Fromm gang BL-17 was used to infiltrate Thall Jobens speeder racing team by befriending C-3PO. R2-D2 never trusted him, and the droid heroes were helped by the scrap droid Proto-One.